The very first thing your eyes find once you walk in the door is their unbelievably beautiful selection of pastries and treats…I personally have a weakness for any variety of croissants, so the fact that there were 3 different choices for me was heavenly. Their biggest seller (and holy cow, SO YUMMY) is definitely their Strawberry Bavarian Cake. You can grab a little 3inch serving for yourself, or order one of ther larger, party-sized varieties…this cake is absolutely perfect for summer events because it is so light, creamy, and just the right sweetness…and the fresh strawberries just top it off perfectly. The cafe itself provides comfortable seating, coffee and other beverages, and free Wi-Fi. 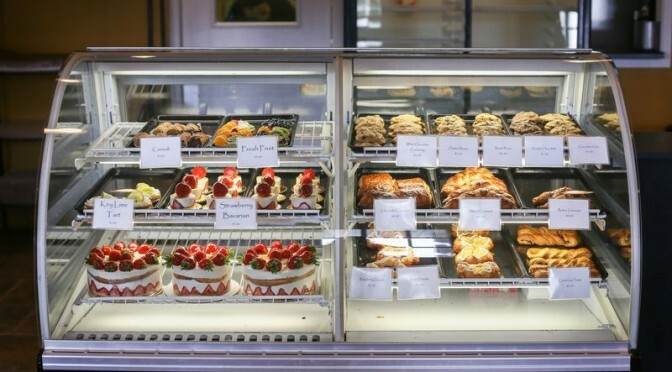 So stop in, have a latte & a fruit tart, and catch up on a little work….they are open from 8-5 every Monday-Saturday and are conveniently located at 500B Courthouse Rd. Fleur de Lis also offers custom wedding cakes of all shapes, sizes, and flavors…so if you’re looking for something that will wow the pants off of your guests, look no further. After all, taste is everything when it comes to dessert!